October negotiations are still underway for VCM business in China with both buyers and sellers showing reluctance to finalize deals, according to ChemOrbis. Sellers are seeking price hikes on top of the September deals while buyers are bidding for either rollovers or even $20/ton decreases, report players in the region. Sellers are not rushing to step back from their initial VCM offer levels as spot ethylene prices continue to move higher in Asia. 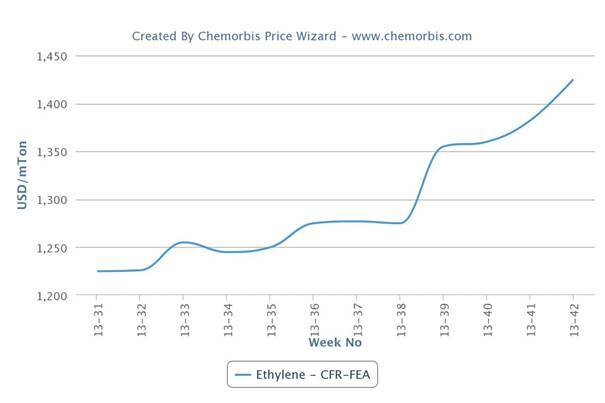 As can be seen from the graph below, spot ethylene prices have recorded hefty increases since early September. 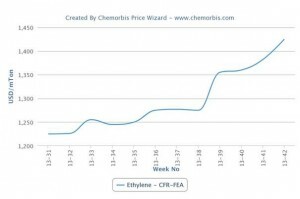 Now tight supplies continue to support the bullish market trend for ethylene following the return of Chinese players from a week long holiday, as per ChemOrbis. Taking the persistent increases in ethylene costs as well as tight supplies particularly in Southeast Asia, VCM sellers are reluctant to give discounts. On the other hand, VCM buyers are in no mood to accept the higher levels for October. Some players even opined to ChemOrbis that some buyers may skip October PVC business as they widely expect to see lower levels in November. The spot VCM market in Asia seems to be squeezed between rising ethylene costs and the weakening PVC sentiment. Some players argue that VCM may not manage to stay firm if the downstream PVC market starts to edge lower, while others point out that any possible softening on VCM prices will be kept in check by soaring upstream ethylene costs.